Here at Alaska Pediatric Surgery, we are proud to do our part in preserving children’s health in Anchorage. Every parent wants the best for their children, but sometimes children need a little help in understanding what that is. When it comes to going to the doctor, many kids experience a heightened sense of fear that can make for an unpleasant experience, which can sometimes even get in the way of their treatment. So that your kids can feel at ease whenever they have to go to a doctor’s office or clinic, here are some tips to help them feel comfortable with doctors. This one is a no brainer for many parents, but unfortunately there are many situations where you are just not going to be able to make a doctor’s appointment with your child. 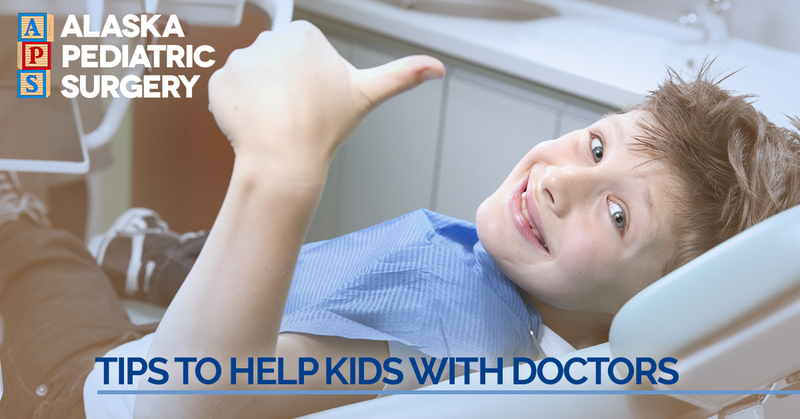 Especially when your children are younger, do everything you can to accompany them on doctor visits. Children learn by watching, and there is nobody that they watch more than their parents. If they are able to see that you are comfortable in the new setting, then they will feel much more comfortable and secure. Part of what makes a doctor’s visit so scary for children is the newness of it all. Preparing them for their new experience is a great way to help them deal with their fear of the unknown. It can even make for a fun game. You can get a toy doctor kit and lab coat, walk them through the procedures (looking in their mouth, nose, eyes, checking reflexes, etc. ), and generally give them a feel for what to expect. There are also lots of great resources like children’s books to help prepare your kids for going to the doctor, including The Berenstain Bears Go to the Doctor and Say “Ahhh!”: Dora Goes to the Doctor. We are all guilty of it. Sometimes it is easier to just lie to our kids, for convenience, than to sit down and explain a situation to them long enough for them to understand. When it comes to going to the doctor, this is something to avoid. Kids are underdeveloped and ignorant of the world, but they are not dumb. Saying things like “the shot won’t hurt” are lies, even if they are white lies with a good purpose, and your kid will pick up on them. Instead, tell them the truth; something along the lines of “The shot will hurt, but only for a second. And it is to help you get better” will prepare your kid for the pain of the shot, comfort them that it will be over soon, and help them understand why they need it, all while telling the complete truth! Bringing a child’s favorite toy or stuffed animal can go a long way to helping them feel comfortable in a doctor’s visit. If they are extremely fearful, it may help to ask the doctor to do a cursory “practice examination” on the toy, just to show the child what to expect and that everything will be just fine. Additionally, if the child has an older sibling, letting them go first is another great way to show your child that everything will be fine. Sometimes helping your child get comfortable during doctor’s visits is as simple as finding the right doctor. Put a little time into research before you pick a family practitioner, and trust your instincts on which one will build the best repertoire with your child. Parent recommendations and online review sites can also give you a glimpse into how they run their practice, especially in regards to their ability to engage with children. Follow these tips, and hopefully your child will be one step closer to a stress free doctor’s visit. If your child requires pediatric surgery in Anchorage, Alaska Pediatric Surgery can help. For more information about our services, please do not hesitate to give us a call today. One of our friendly and knowledgeable representatives will be happy to provide any information that you might need.